Relationships Enable Your Happiness and Success. I earn my living by leveraging the Extraordinary Power of Project Relationships. I’m what some people call a hired gun. As a management consultant as well as a workshop trainer in business and non-business venues, I sell my talents to corporations, governments and individuals who need help to turnaround all manner of projects. The bigger the challenge, the more I am exhilarated. And behind every challenge are people. People, as individuals and in groups, are always the key to success. That’s why relationships matter so much. Relationship issues can destroy the most skilled team. Constantly complaining Cathy, Bulldozer Boswald, Lazy Larry and Manipulative Margo can ravage costly and normally productive technologies as teams. In contrast, Hardworking Harry, Responsible Rachel, Open-minded Oscar and Persevering Peter can conquer the most difficult of assignments. Take the test in the first section of the book. Rate your relationship practices. The remainder of the book will help you by conveying topics in an uncluttered and direct manner. Concise narrative reveals best practices. There are twenty-four chapters. Twelve identify and provide key enablers for better relationships with individuals, twelve for fostering the best project relationships with groups. Some people are natural connectors. They know how to “read” a person’s mood, listen “between the lines” and sympathize with a point of view. But for most of us, to learn to relate requires us to overcome several obstacles. We must avoid long practiced bad habits and misinterpret titles, jargon, nonverbal cues and management techniques that shield people from one another. By focusing on certain cues and ignoring others, a person can continually reinforce a misconception about another individual. This creates a recurring cycle of poor relating habits and negative responses from others. The effects of faulty relationship skills are manifold. Unethical activities, failed plans and demoralized corporations are direct byproducts. Confusion reigns. Even highly motivated leaders become enmeshed in a complex spider web of negative relationships. Granted, project managers are under a lot of pressure to perform. Deadlines must be met, budgets abided by and decisions reached without a great deal of lead time. Many times, managers succumb to the task at hand. They do not adequately focus on the individual or group processes that achieve outcomes. Interaction skills are vital relationship skills which produce trust between people. The interaction can take two forms: symmetrical or complementary. In symmetrical relationships, individuals share personal qualities or goals. Generally, symmetrical communications yield a sharing of feelings and ideas. There is a friendly, easy-going atmosphere. Complementary relationships occur in cases of wide variances in communication styles or personality. In some teams, members play complementary roles such as creators or investors and integrators and managers. In this type of relationship, the two styles balance each other in order to produce positive results. On the down side, these relationships may represent ongoing struggles. 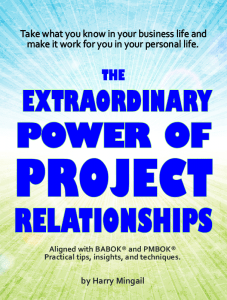 Cultivate the Extraordinary Power of Project Relationships. 1. Empower and give ownership of assigned work. 2. Nurture openness, truth and honesty. 3. Sanction flexibility, diversity and options to jobs, staffing, innovation and alliances. 4. Streamline administrative processes and sufficiently fund initiatives as objectively justified by the PM. 5. Training and organizational safety nets allow staff to develop and exercise risks as their projects develop. 6. Be understanding of failure as rungs in the ladder of success. 7. Bestow projects with responsibility for their own bottom line. 8. Effectively manage conflicts without diminishing creativity, enterprise and healthy competition. 9. Encourage project staff to take reasonable risks where justified by rewards.